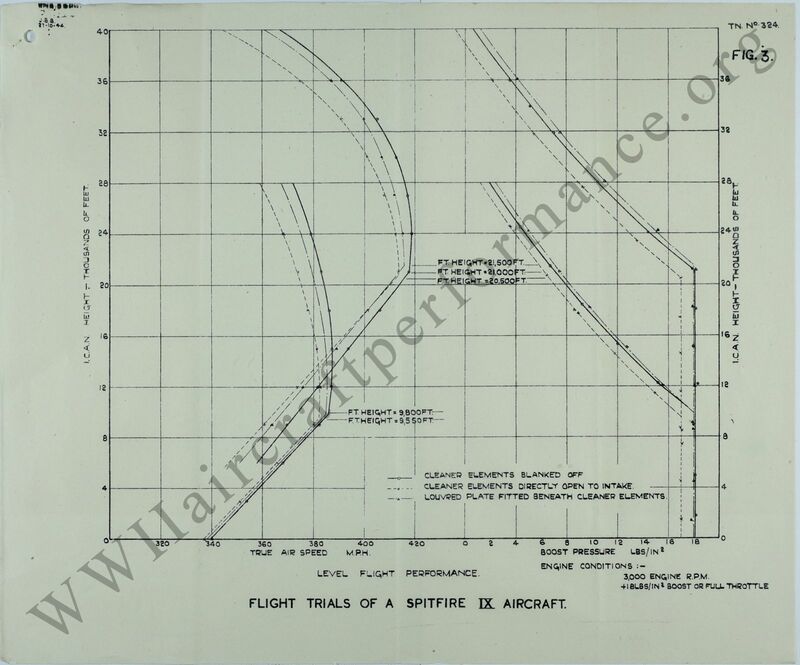 ..................Climb and level speed performance has been measured on Spitfire F. Mk. 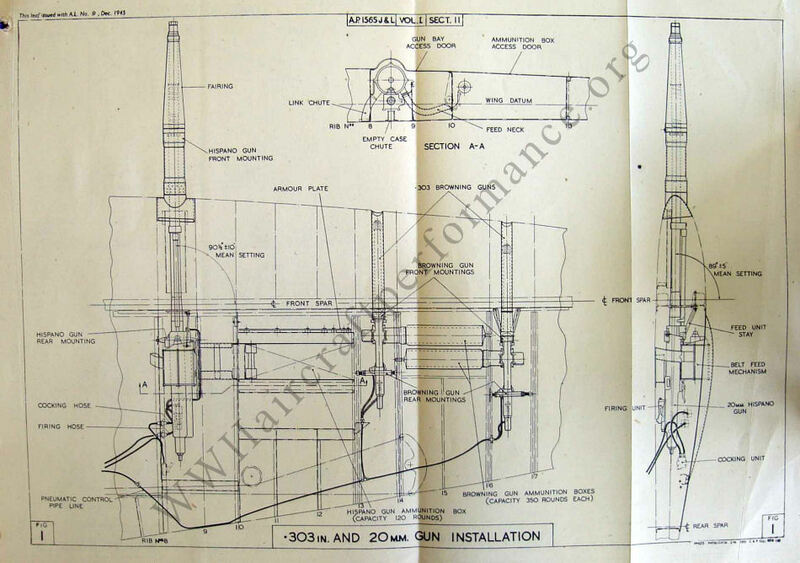 IX B.F.274 both with and without a 30 gallon external jettisonable tank fitted. 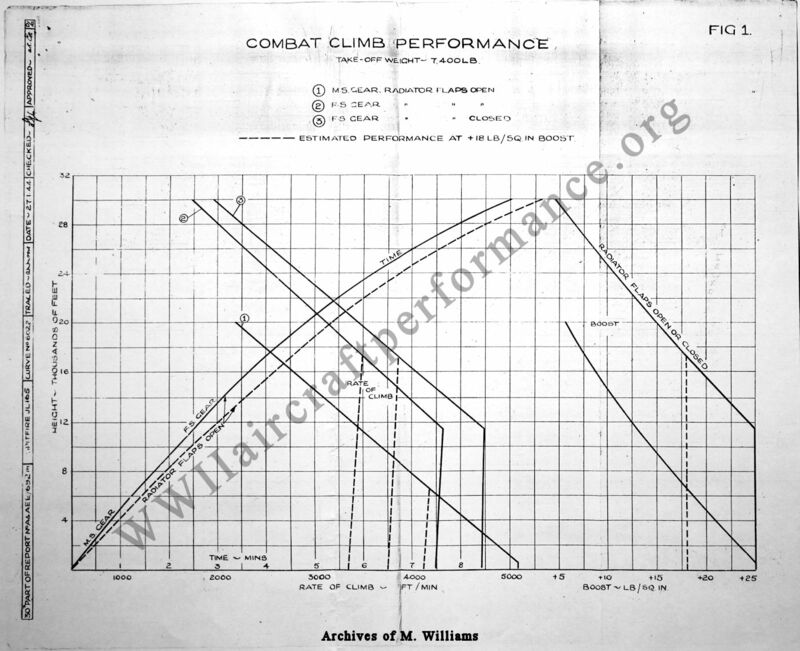 The climb performance at combat rating and position error have also been measured without the tank fitted. 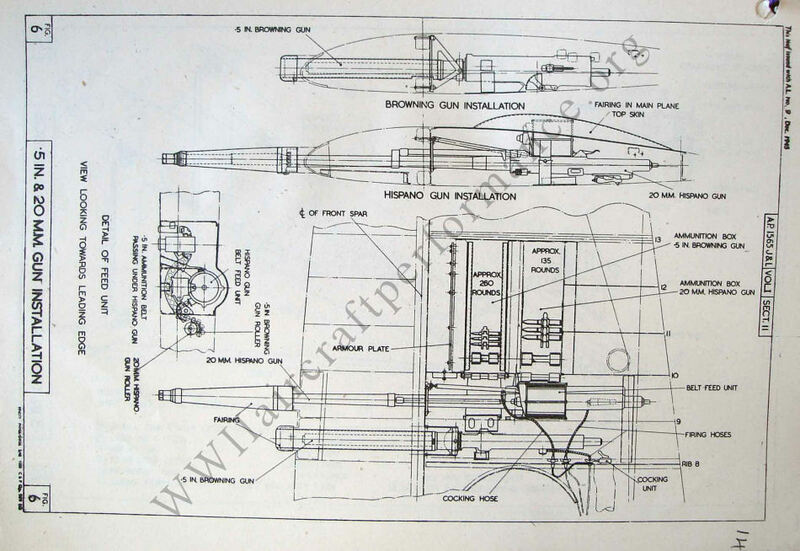 The engine was fitted with a 0.477:1 reduction gear and a Rotol R3/4F5/3 metal propeller. Maximum rate of climb in M.S. supercharger 3200 ft.min at 13,500 ft. Maximum rate of climb in F.S. supercharger 2540 ft/min. at 25,900 ft.
Service ceiling (100 ft/min) 42,100 ft.
Time to 10,000 ft. 3.1 mins. Time to 20,000 ft. 6.5 mins. Maximum rate of climb in M.S. supercharger 3860 ft.min at 12,600 ft. Maximum rate of climb in F.S. supercharger 3020 ft/min. at 25,200 ft.
Service ceiling (100 ft/min) 43,400 ft.
Time to 20,000 ft. 5.6 mins. Maximum true air speed in M.S. supercharger 380 1/2 m.p.h. at 15,400 ft. Maximum true air speed in F.S. supercharger 403 m.p.h. 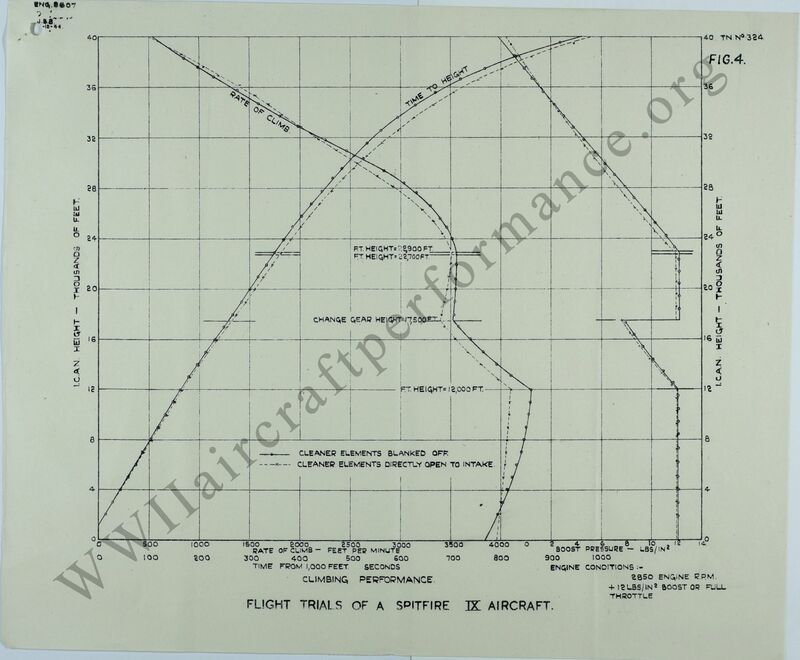 at 27,400 ft.
..................Level speed measurements have been carried out on this aircraft to assess the effect of fitting a 500 lb bomb on an unfaired rack beneath the fuselage. The installaton was one designed and fitted by Fighter Command personnel. ..................Level speed performance was measured between 11,000 ft. and 21,000 ft. using all-out level power conditions in M.S. supercharger gear with the radiator flaps closed. ..................The reduction in maximum true air speed in M.S. supercharger gear due to fitting a 500 lb. bomb and a bomb rack without fairing is 22 m.p.h. First flight from Eastleigh 26-8-42. Transferred to 402 Sqdn. 26-8-42, Farnborough November 42 , Boscombe Down for above trials 14-1-43, 421 Sqdn 20-5-43, 611 Sqdn 15-10-44. 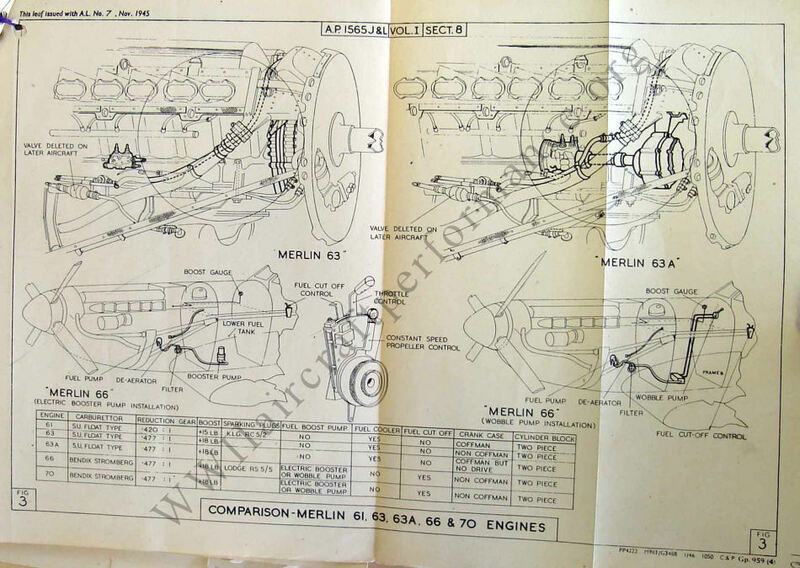 Sold 24-11-49.
altitude versions of the intercooled Merlin engine. ..................Two low altitude versions of the intercooled Merlin engine were made which were designated the RM-9SM and RM-10 SM. 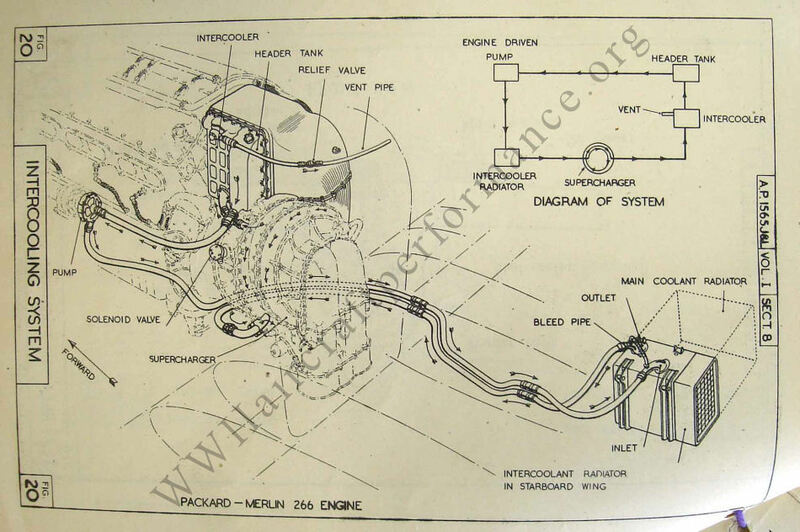 In addition an improved type of high altitude engine designated the RM-11 SM was made. The RM-10 SM and the RM-11 SM were subsequently given mark numbers and are now known as the Merlin 66 and Merlin 70 respectively. Rate of climb at Sea level 4620 ft/min 4390 ft/min. at 7000 ft. 4530 ft/min. height in F.S. supercharger gear 3860 ft/min. at 18,000 ft. 3480 ft/min. Rate of climb @ 30,000 ft. 2125 ft/min. 2600 ft/min. Time to 10,000 ft 2.15 mins. 2.25 mins. Time to 20,000 ft 4.75 mins. 4.85 mins. Time to 30,000 ft 8.4 mins. 8.05 mins. Time to reach above height 12.9 mins. 12.6 mins. Service ceiling (100ft/min) 40,900 ft. 41,000 ft. Estimated absolute ceiling 41,300 ft. 41,300 ft. Maximum level speed at sea level 336 m.p.h. 329 m.p.h. full throttle height 384 m.p.h. at 10,800 ft. 396 m.p.h. full throttle height 407 m.p.h. Level Speed at 30,000 f.t 395 m.p.h. 413 m.p.h. Note: BS.543 was built as a Mk V, converted to Mk IX (Merlin 61) at Rolls Royce, Hucknall. 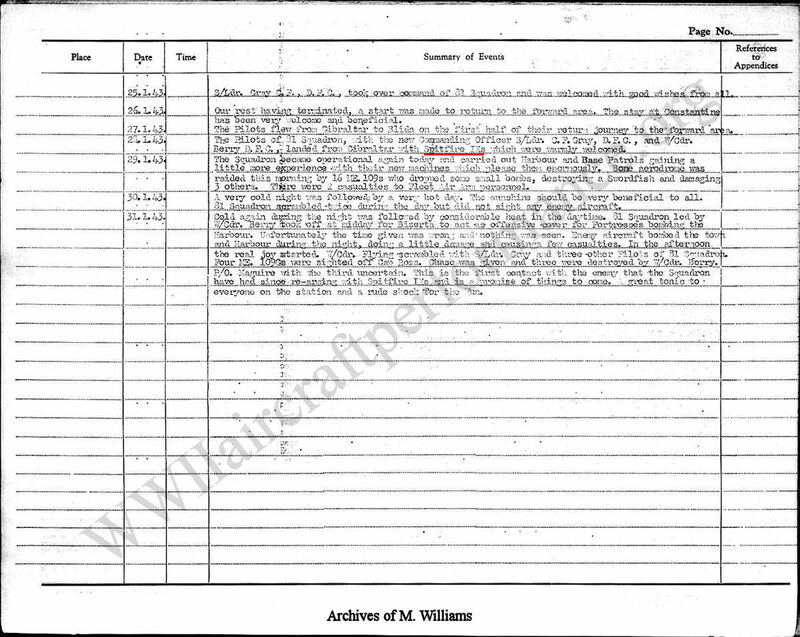 First flight 22-10-42. Transferred to AFDU, Duxford 8-11-42; AAEE, Boscombe Down 13-12-42 with Merlin 66 installed; Vickers Armstrong 22-2-43; 403 Sqdn. 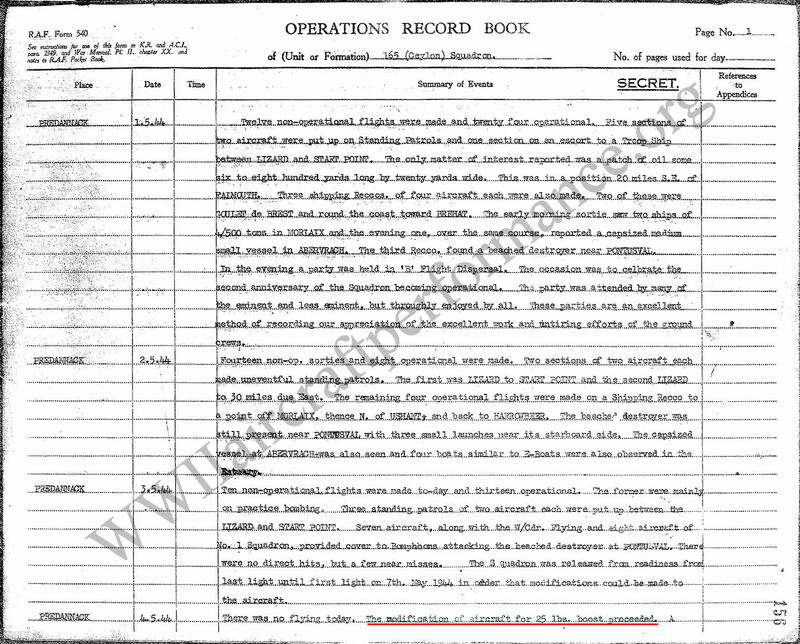 9-6-43; 611 Sqdn. 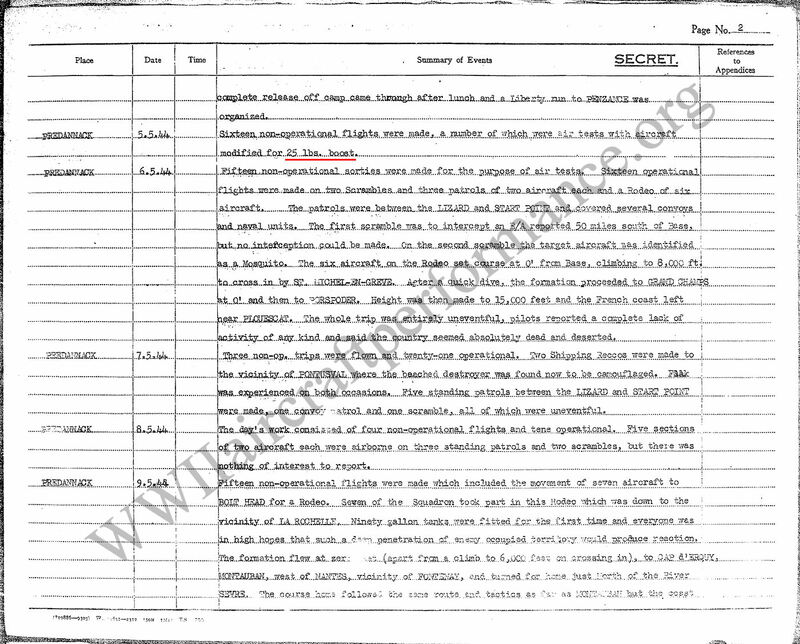 10-6-43; 485 Sqdn. 6-7-43. 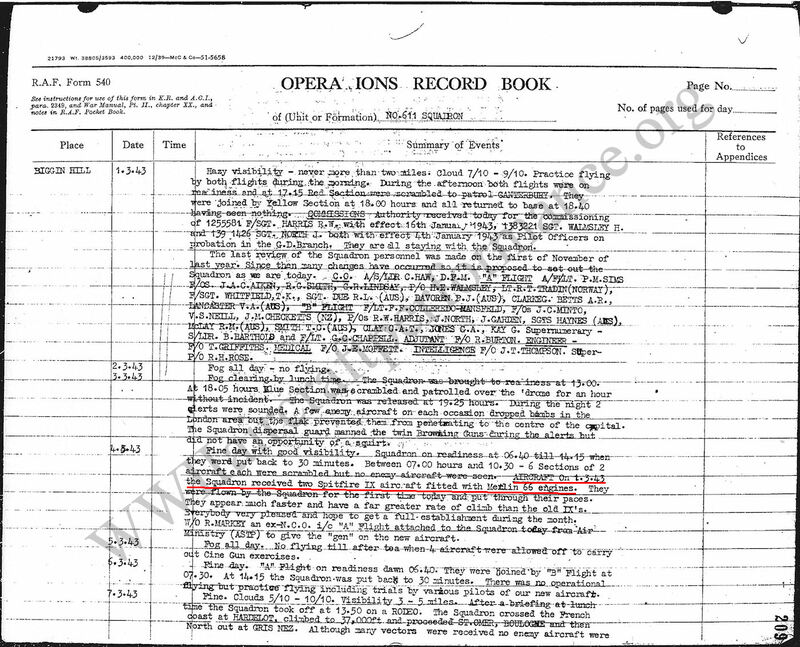 Failed to return from operations 22-8-43. BS.551 was built as a Mk V, converted to Mk IX (Merlin 61) at Rolls Royce, Hucknall. 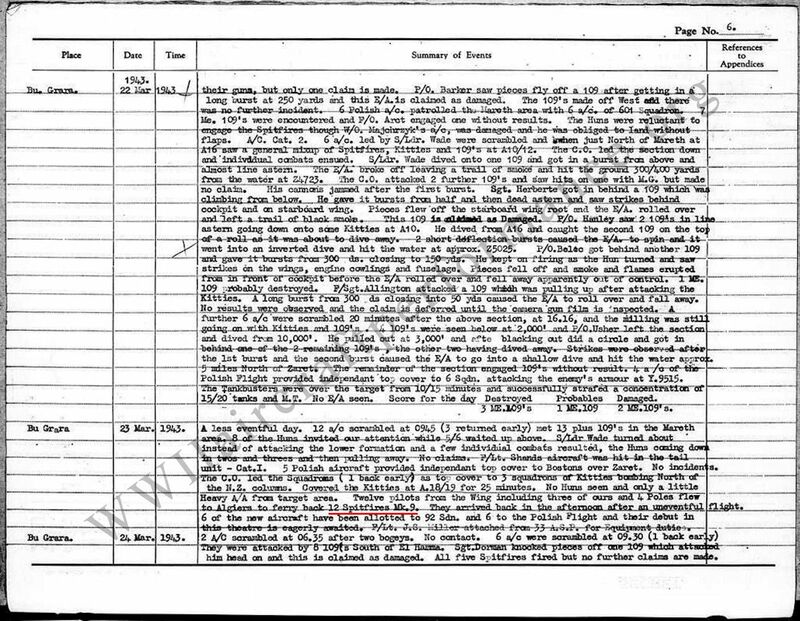 First flight 31-10-42. Merlin 70 installed by Rolls Royce, Hucknall 1-11-42. 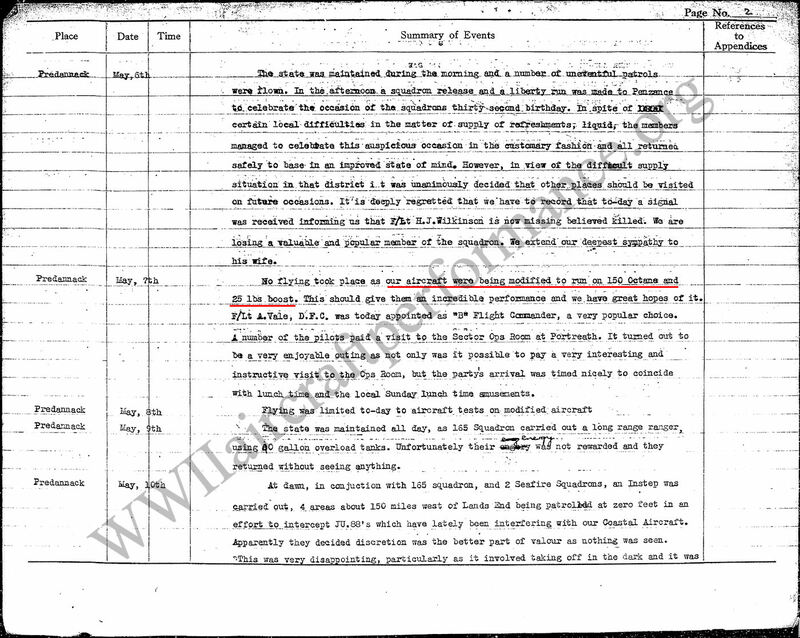 Flying accident, category E 4-1-43. 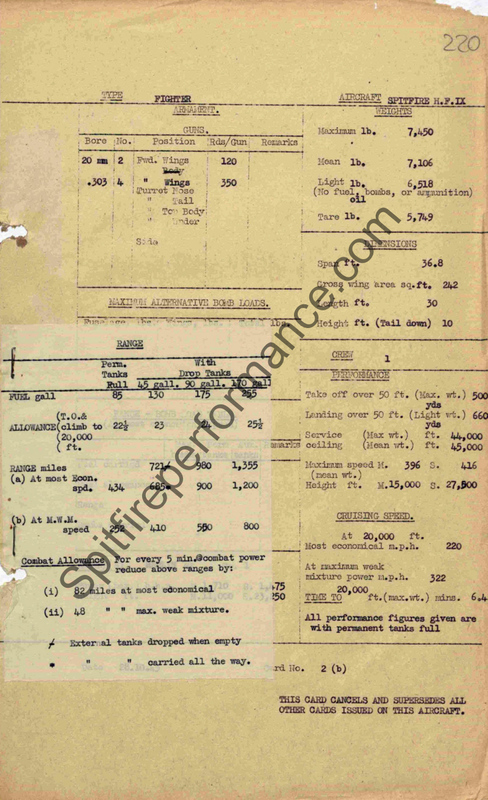 ..................It was stated (in the above report) that further tests were to be carried out with a modified carburettor setting as it was hoped to improve the performance of the Merlin 70 at altitude. It is understood that EN.524 incorporated this modification and a comparison of the two sets of results shows a considerable improvement has been made. The absolute ceiling is now about 2,500 feet higher than that obtained on BS.551. 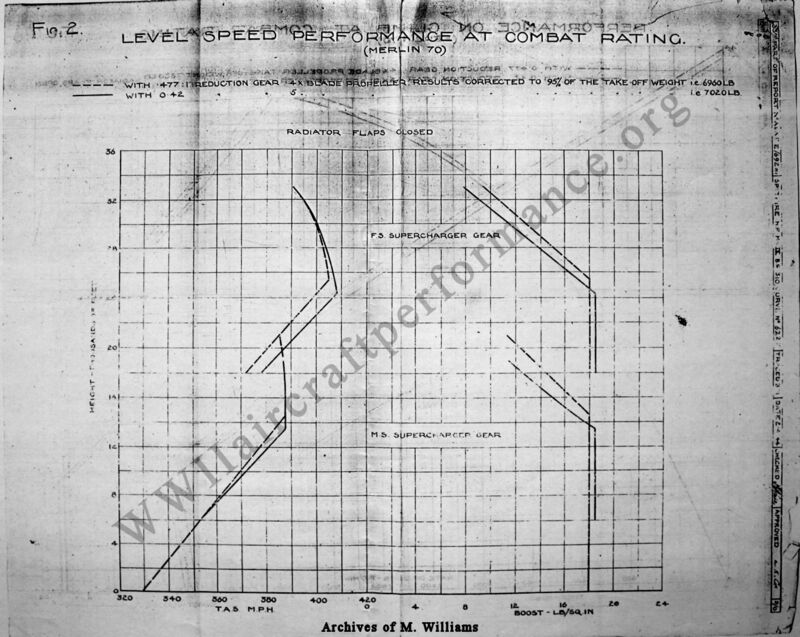 ..................The combination giving the best compromise between climb and level speed performance appears to be the 10'9" diameter propeller with 0.477:1 reduction gear up to about 28,000 feet. Above this height the best combination appears to be the 11'1" propeller with 0.42:1 reduction gear. ..................However, the differences as a whole are so small that a change from any combination already produced and in Service (0.477:1/10'9") would not appear to be worthwhile. 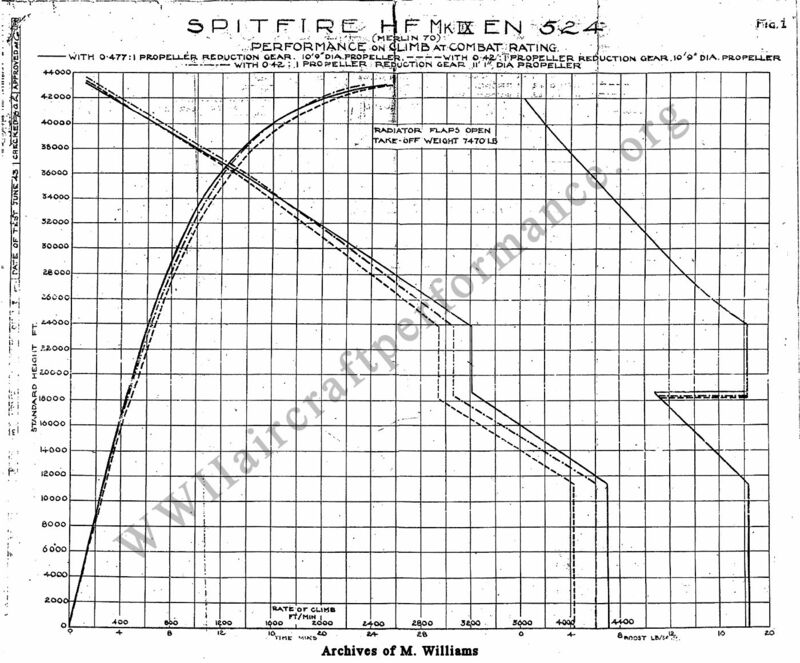 ..................Compartive climb and level speed performance trials have been made on Spitfire HF. Mk. IX BS.310 with a 0.477:1 reduction gear and a 4 blade propeller, and with a 0.42:1 reduction gear and a 5 blade propeller. Time to 5,000 feet 1.15 min. Time to 11,200 feet (M.S. gear F.T. Ht.) 2.55 min. Time to 15,000 feet 3.5 min. Time to 22,700 feet (F.S. gear F.T. Ht.) 5.65 min. Time to 25,000 feet 6.4 min. Time to 35,000 feet 11.05 min. Time to 40,000 feet 16.25 min. Estimated service ceiling 43,100 ft. ..................The performance of the aircraft is similar with either propeller-reduction gear combination and no particular advantage in performance would be obtained by replacing the 4 blade propeller by a 5 blade propeller. Note: BS.310's first flight took place on August 31, 1942. 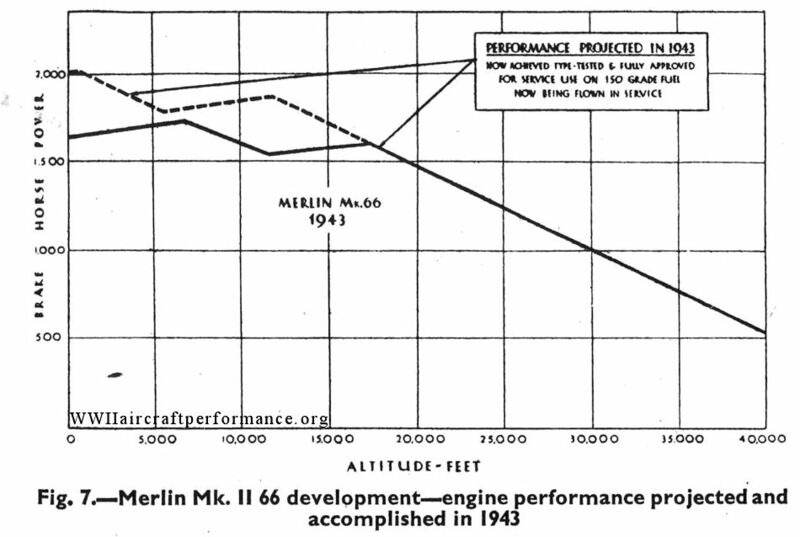 Performance with the original Merlin 61 installed was 381 mph at 15,700' in MS gear and 413 mph at 28,000' in FS gear. It underwent brief performance trials at Vickers Armstrong, Worthy Down in December 1942 while fitted with a Merlin 66. 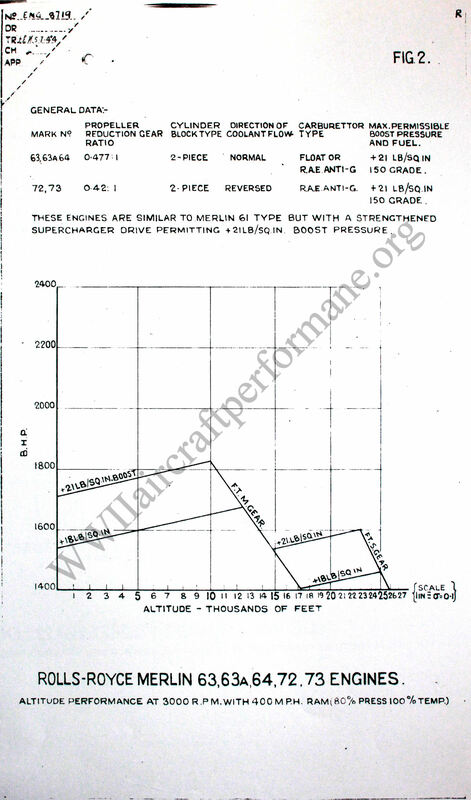 The level speed results were 372 mph at 8,200' in MS gear and 404 mph at 19,500' in FS gear. Rate of climb was 4,850 ft/min at 6,000' in MS gear and 4,500 ft/min at 16,500' in FS gear. 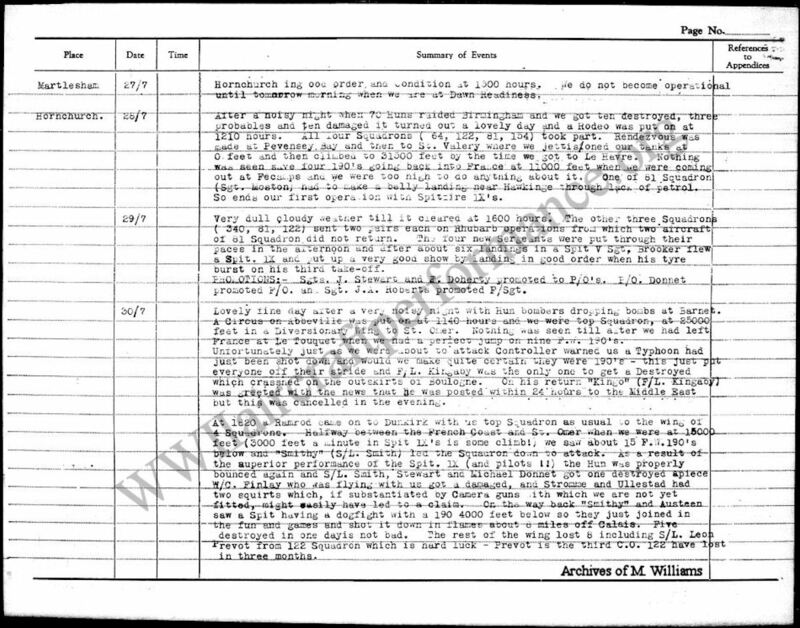 Failed to return from operations 27-9-44. 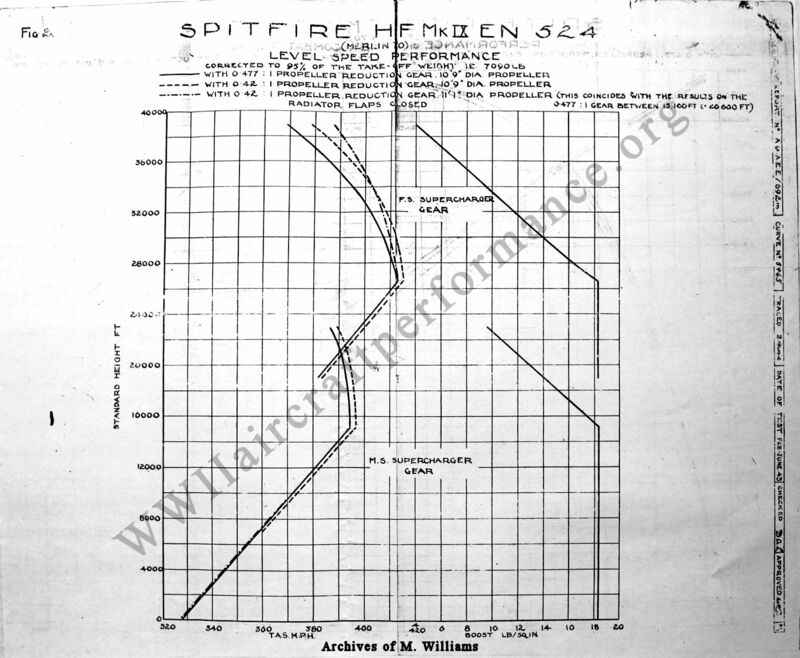 The increase of boost pressure to 25 lbs/sq.inch provides a considerable improvement in the low altitude performance of the Spitfire IX aircraft, the necessary modifications to achieve this being comparitively simple. 5,000 5080 110 " "
10,000 5080 800 " "
15,000 4470 190 " "
Altitude feet + 18 lbs. Boost. + 25 lbs. Boost. Increase. 0 330 M.S. 354 M.S. + 24 M.P.H. 3,200 343 " 367 " (a) + 24 M.P.H. 8,000 364 " 367 " + 3 M.P.H. 10,000 367 " 377 F.S. +10 M.P.H. 14,400 373 F.S. 397 (a) + 24 M.P.H. 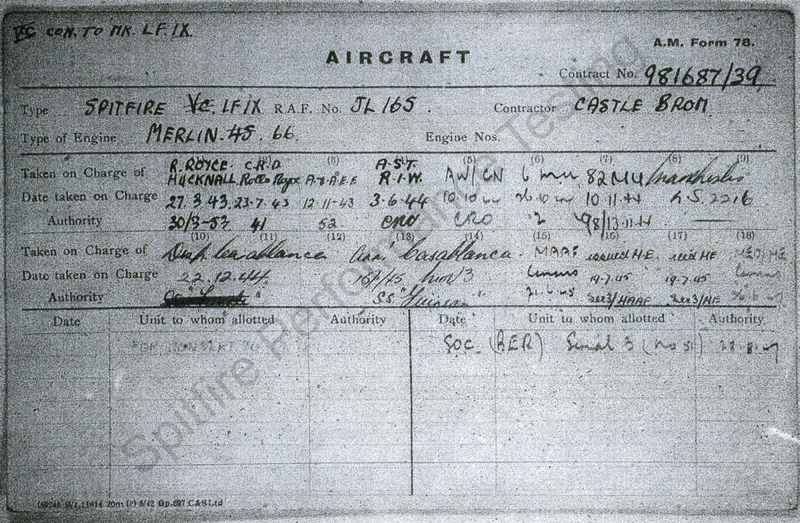 Note: JL.165 was manufactured at Castle Bromwich as a Spitfire V (Merlin 45) and delivered on March 27, 1943. 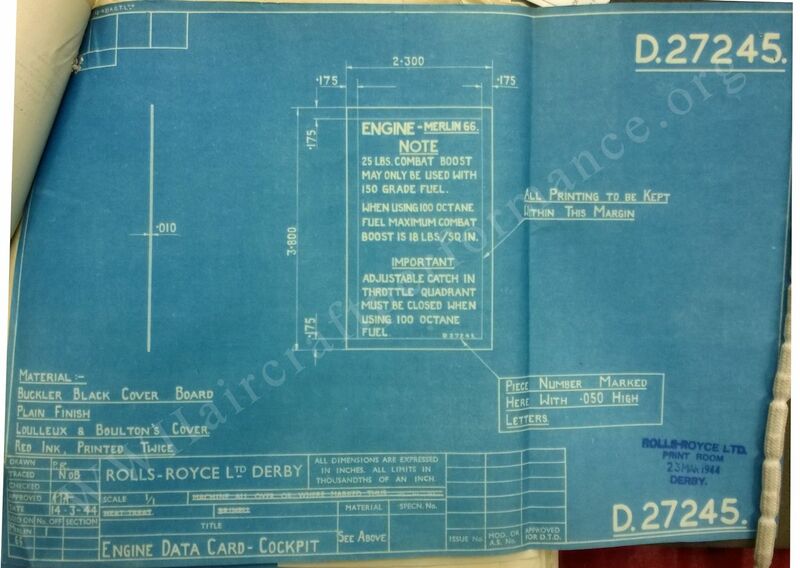 It was subsequently converted to a LFIX (Merlin 66) at Rolls Royce, Hucknall. Performance trials at Rolls Royce, Hucknall using +25 lbs. boost in October 1943, AAEE for trials 11-11-43, Transfered to Air Service Training 3-6-44, 6 Maintenance Unit 26-10-44, 82 Maintenace Unit 10-11-44, Casablanca 15-1-45, Struck off charge 28-8-47. 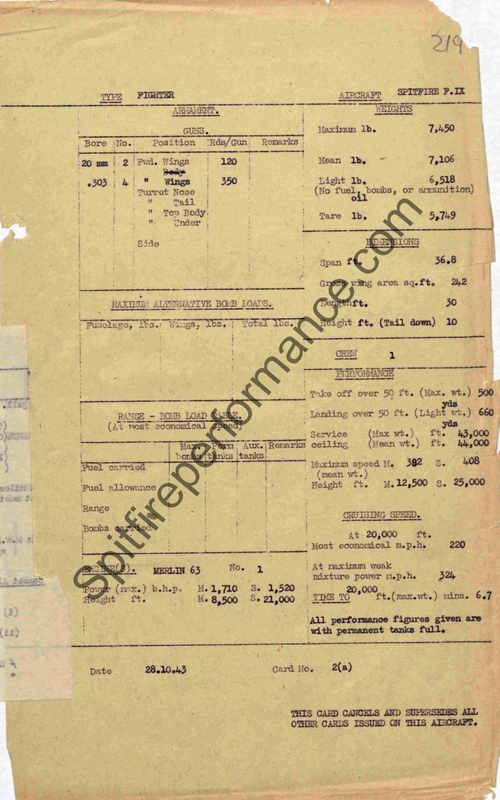 ..................Performance trials and a brief assessment of handling characteristics have been completed on a standard Spitfire IX with Merlin 66 engine, adjusted for maximum boost of +25 lb/sq.inch. 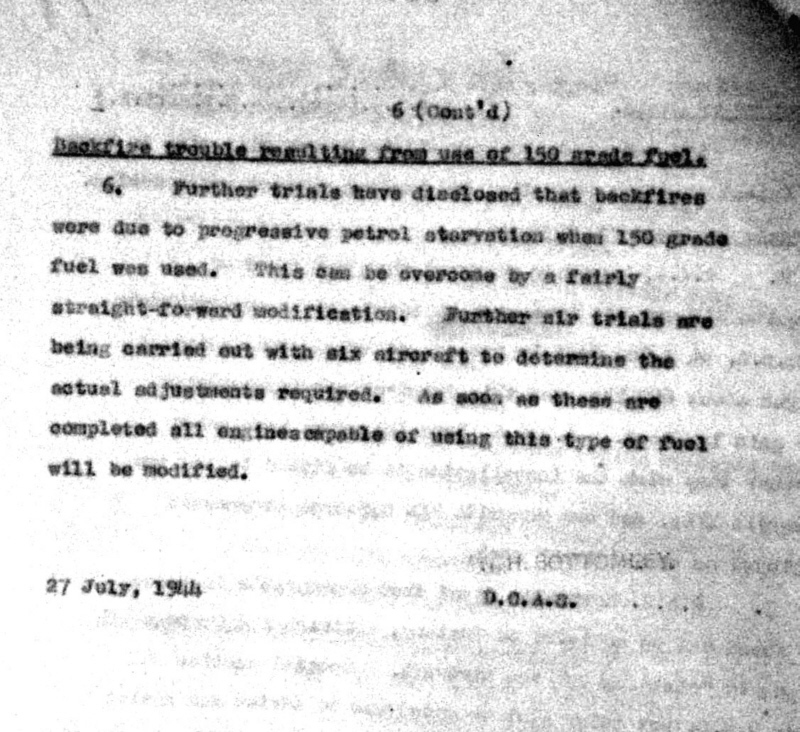 150 grade fuel to Specification RDE/F/253 was used through all tests. Engine conditions - 3000 rpm + 25 lb/sq.in. boost. increase in boost from +18 to +25 lb/sq.in. 30 mph. ..................A Rolls Royce S.U. fuel injection pump, Mark II has been fitted to Spitfire LF Mk.IX MA.648 in place of the normal Bendix carburettor and level speed performance has been measured as part of the general schedule of tests including fuel consumption and behaviour under negative 'g'. ..................These results compare favorably with those of other Spitfire LF Mk. 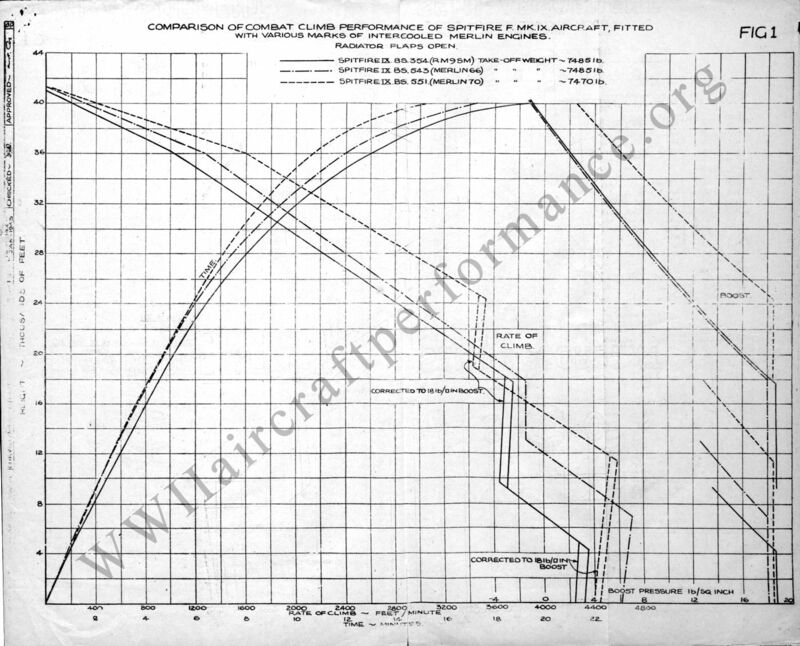 IX aircraft, which fact is attributed cheifly to the higher full throttle height obtained with the S.U. pump. 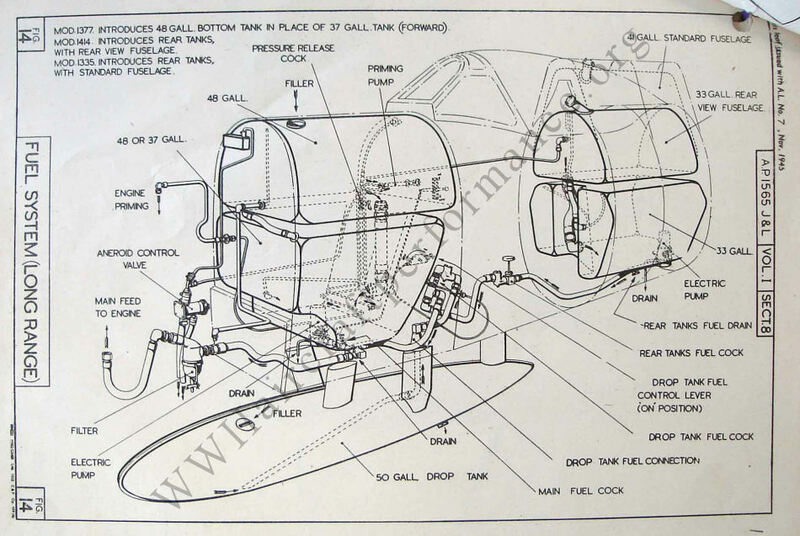 When air cleaner elements are fitted to the universal air intake of the Spitfire IX aircraft, a loss of pressure in the ramming intake results, due to spoilage of the air flow by the irregular contour of these elements, and possibly in part to leakage of air through these elements into the engine bay. A louvred plate has been devised to minimize the latter effect. 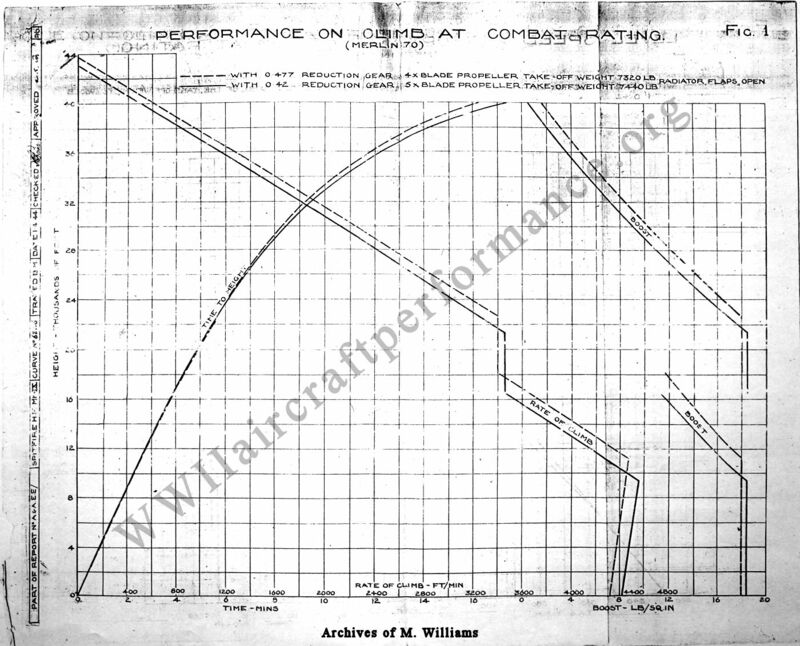 The loss of performance was measured without the louvred plate in position, and was found to be considerable at high altitudes decreasing to zero below the full-throttle height of the engine. It could be reduced by between 50 and 70% at altitude by using the louvred plate. When operating from dust free aerodromes the loss can be entirely avoided by fitting a blanking plate beneath the cleaner elements. 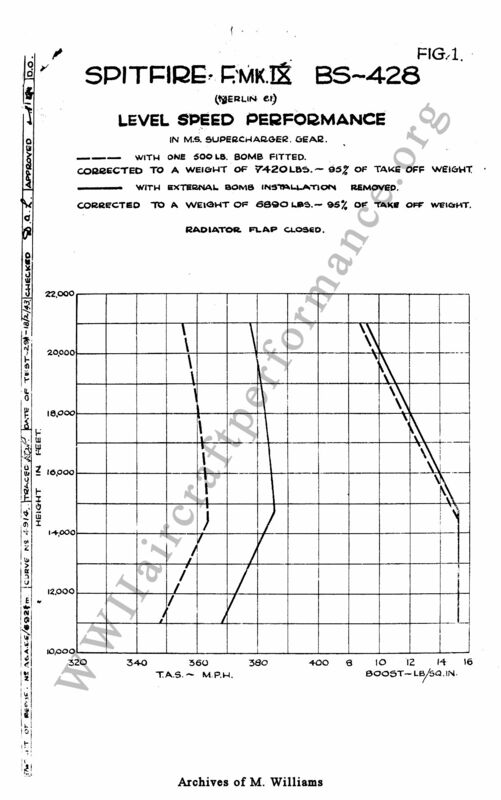 Loss of effective ram with the filter elements fitted causes a vitrually constant loss of boost pressure at heights above the full throttle heights, rather greater in F.S. gear than in M.S. 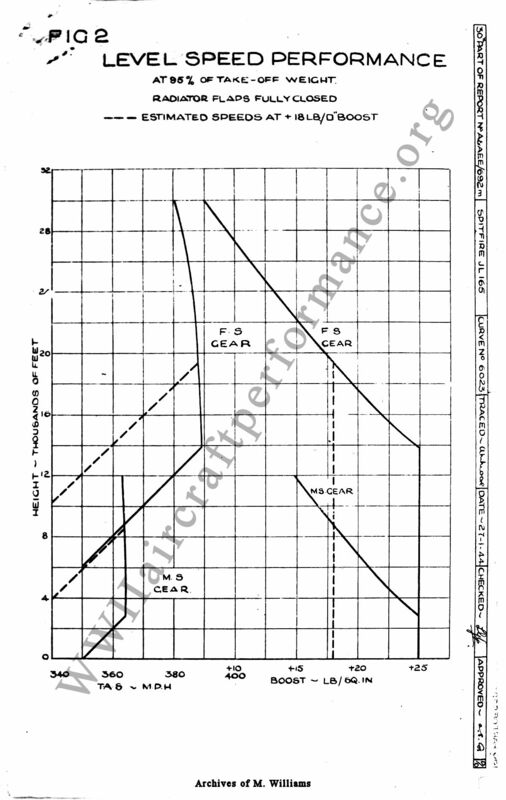 gear due to the higher supercharger compression ratio. 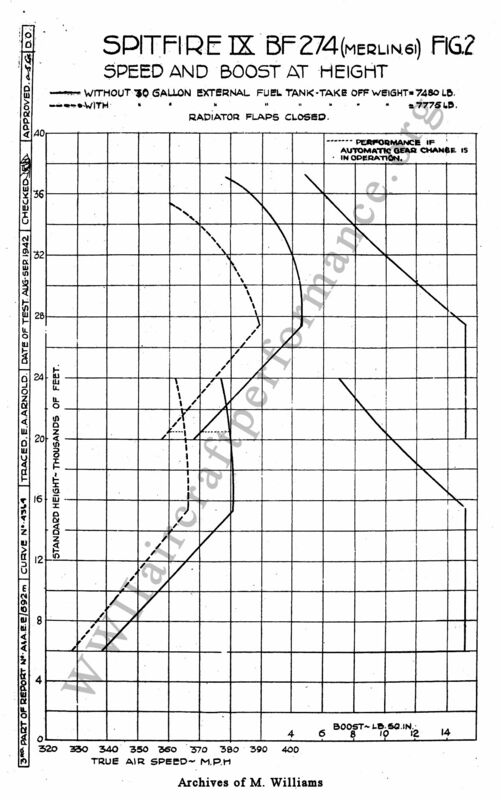 The resulting loss in performance corresponds closely to the power loss caused by the decrease in boost pressure. 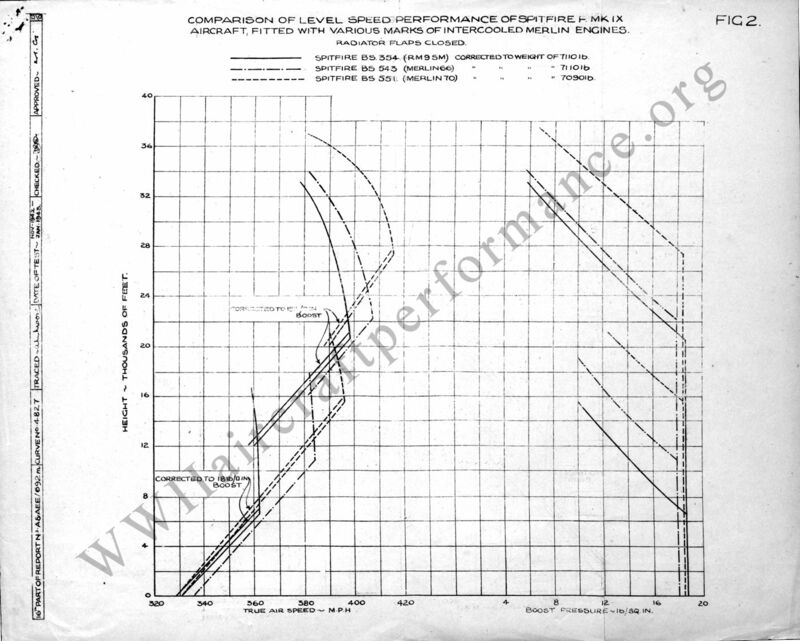 At the higher altitudes the proportionate loss in boost, and therefore in performance, is increased. 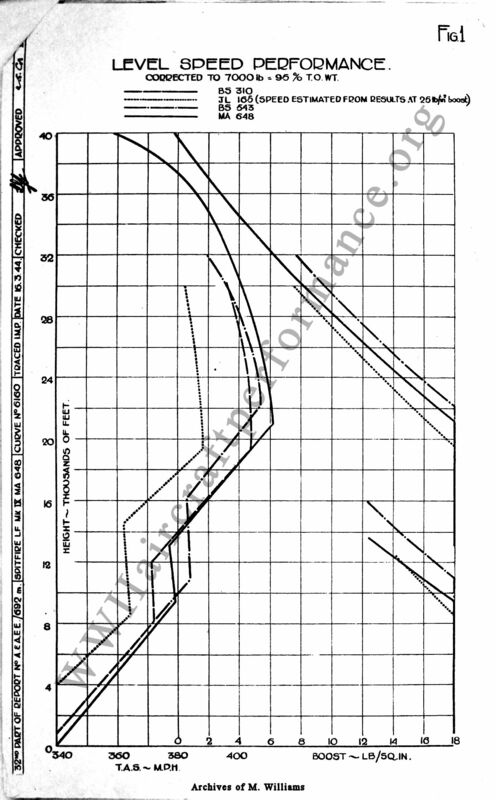 Since these tests show no significant performance loss below the full throttle heights, and therefore no increase in drag due to leakage through the cleaner, it appears likely that the loss of ram is caused mainly by spoilage of the smooth flow of air through the intake by the irregular contour of the cleaner elements. 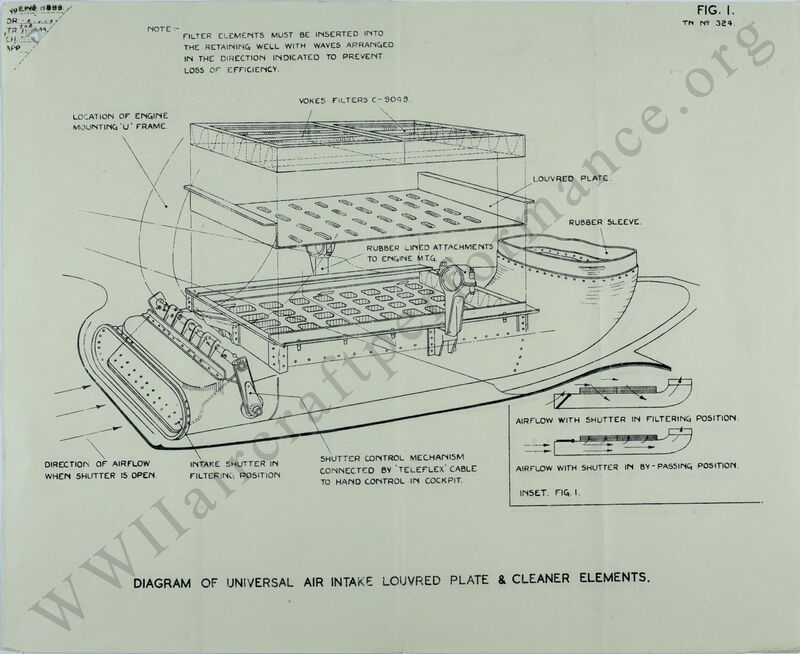 This effect is largely eleminated when the louvred plate is fitted beneath the cleaner elements. The effect of the cleaner elements in climbing performance is practically negligible. When the air cleaner can be dispensed with, all performance losses due to the air cleaner can be avoided by fitting a plain blanking plate between the air duct and the filter elements. open to intake T.A.S. M.P.H. 3,000 353.9 351.1 352.2 "
6,000 368.0 365.8 366.6 "
9,000 382.1 380.6 381.4 "
12,000 386.9 382.9 385.1 "
15,000 387.3 381.2 384.6 "
18,000 386.3 377.4 382.8 "
21,000 383.0 373.9 379.6 "
24,000 378.8 367.9 374.9 "
12,000 381.5 373.5 376.0 "
15,000 393.8 387.2 389.0 "
18,000 406.0 401.4 401.8 "
21,000 417.8 413.7 413.8 "
24,000 418.8 412.3 415.3 "
27,000 417.3 407.7 411.8 "
30,000 412.6 401.0 406.8 "
33,000 404.9 391.0 399.8 "
36,000 391.2 374.7 387.0 "
..................No sealed cabin or pressurising equipment. ..................Armament 2 x 20 mm. and 4 x .303" MG's. 380 m.p.h. at 15,000 ft.
405 m.p.h. at 28,000 ft.
394 m.p.h. at 30,000 ft.
..................New aircraft coming into service will be fitted with re-rated engines operating at + 18 lb. per sq. inch boost and 3,000 r.p.m. 385 m.p.h. at 15,000 ft.
409 m.p.h. at 28,000 ft. ..................The rate of climb varies according to type of reduction gear fitted. 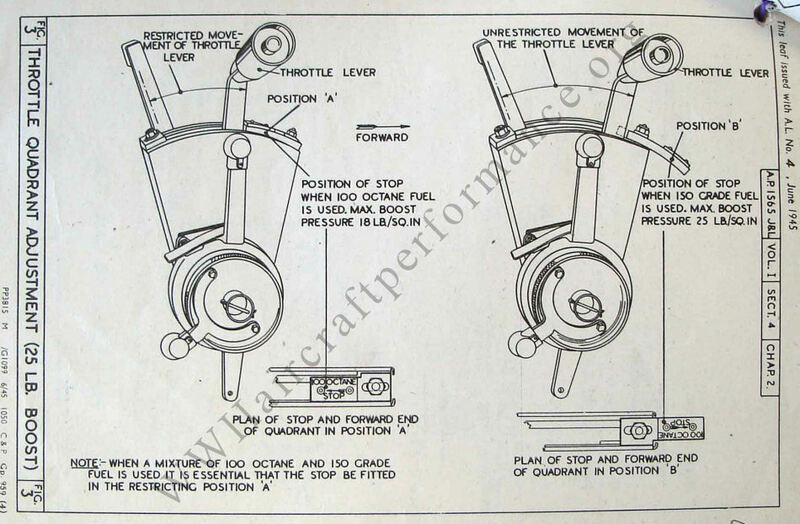 ..................With an 0.42 reduction gear (at + 15 lb. per sq.inch boost) the rate of climb is 2,540 per minute. ..................With the same reduction gear, but at + 18 lb. per sq. inch, the rate of climb is 2,750 ft. per minute. ..................With an 0.477 reduction gear (at + 15 per sq. inch boost) the rate of climb is 2,950 ft. per minute and increases to 3,230 ft. per minute at + 18 lb. per sq. inch boost. 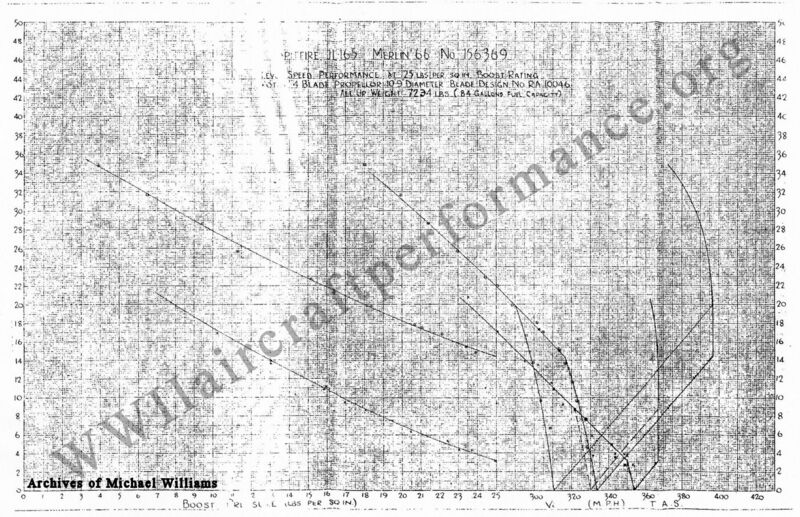 With 0.42 reduction gear: 41,000 ft.
With 0.477 reduction gear: 43,000 ft. ..................Both the Me 109 G and the FW 190 A were originally, and in some cases still are operated at a reduced engine rating. 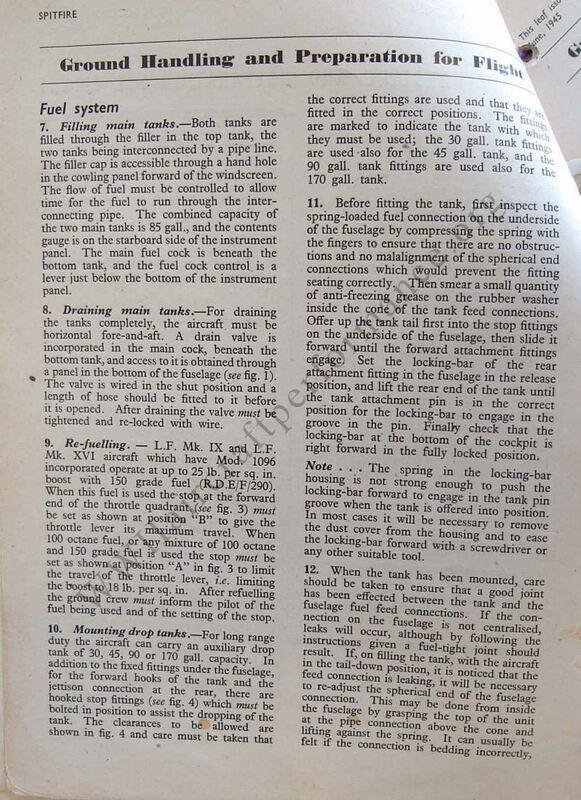 Performances given correspond to the full engine ratings. 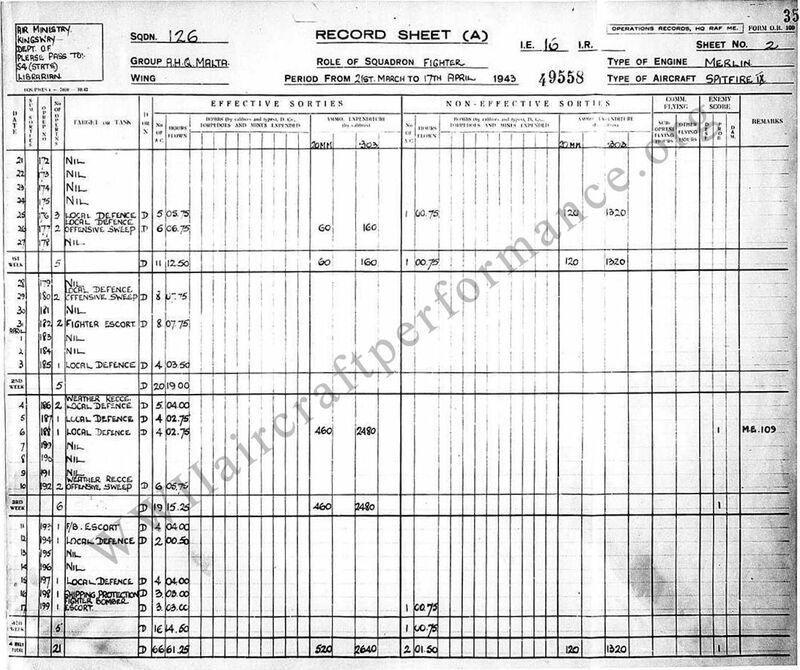 ..................Me 109 G fighters are slightly faster than the Fw 190 A at 20,000 to 22,000 ft. The difference of speed increases with altitude and is about 25 m.p.h. 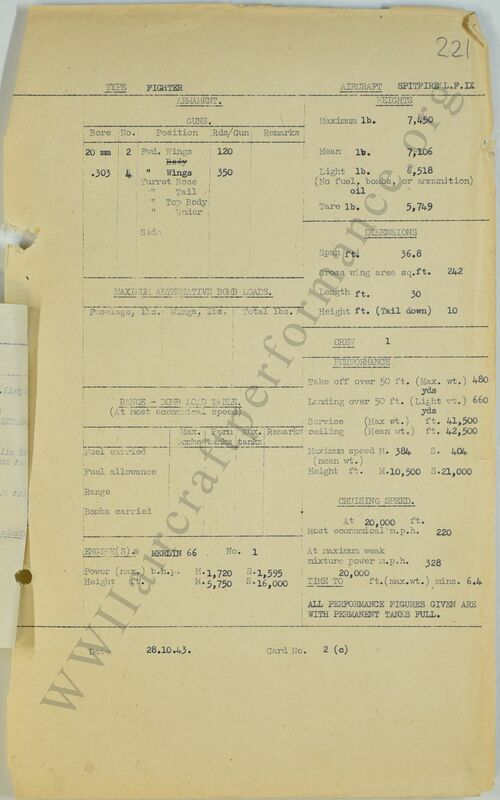 at 30,000 ft. in favour of the Me 109 G. 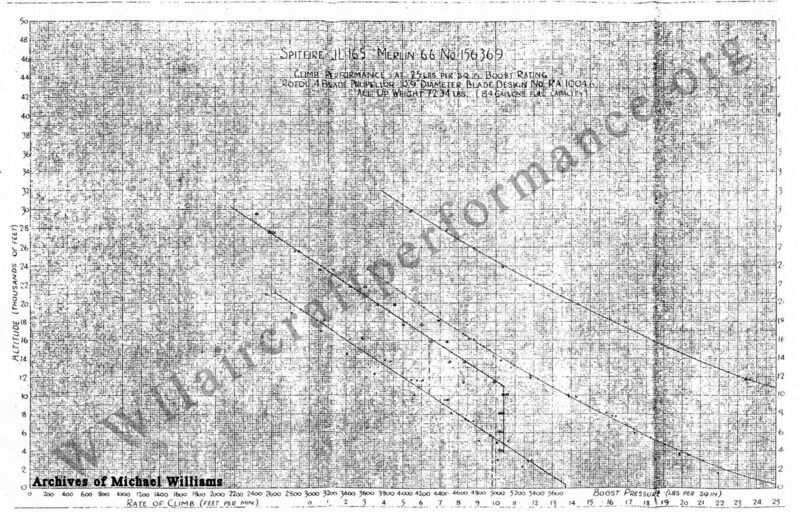 ..................The rate of climb of the Me 109 G, without additional guns, is slightly better than that of the Fw 109 A. The same remark applies to the service ceiling. 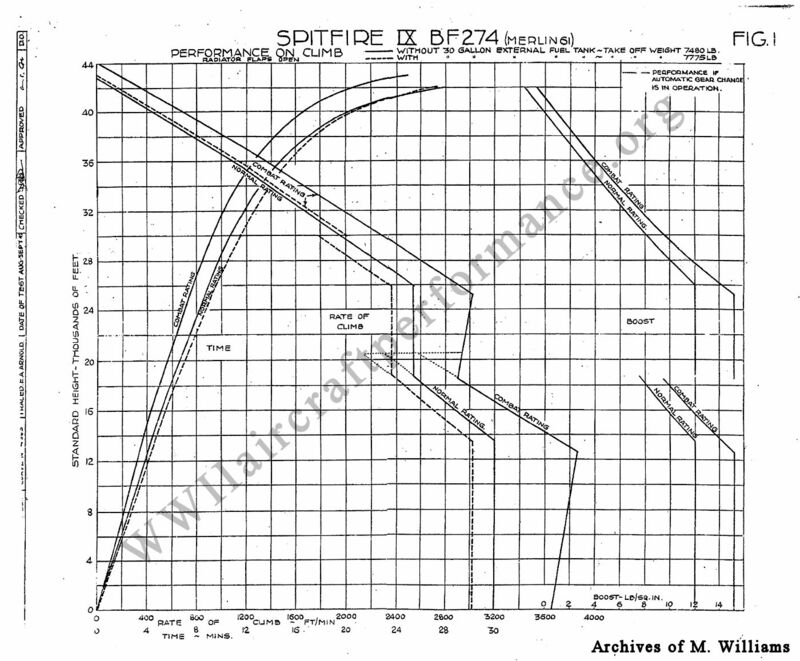 ..................The Spitfire IX at 28,000 to 30,000 ft. is superior in speed to the Me 109 G and the Fw 190 A. 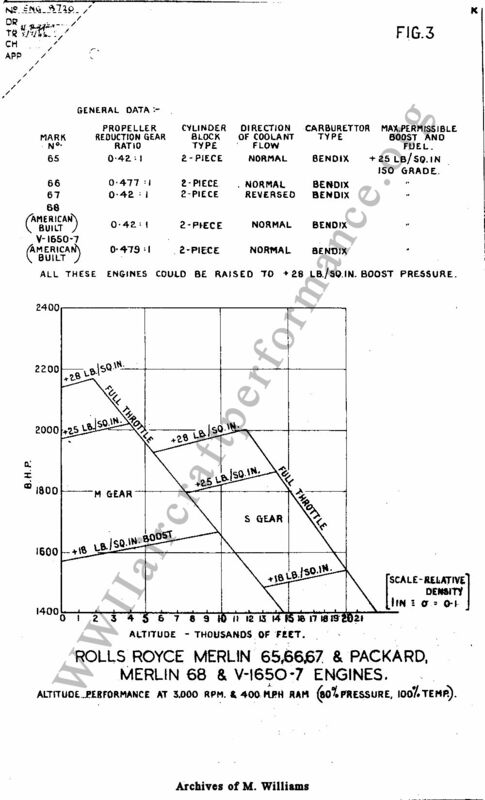 ..................Its rate of climb at 20,000 ft. with the 0.42 reduction gear is inferior to the Fw 190 A and the Me109 G, even when operating at +18 lb. per sq. inch boost. 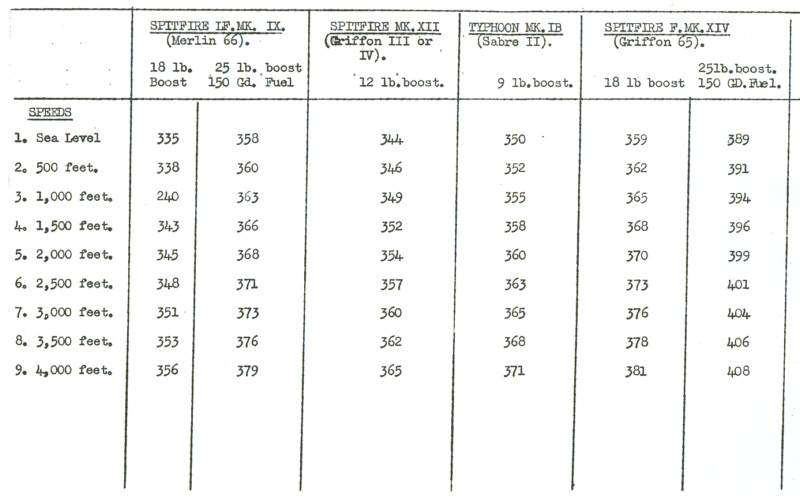 ..................When fitted with the 0.477 reduction gear and at +15 lb. per sq. 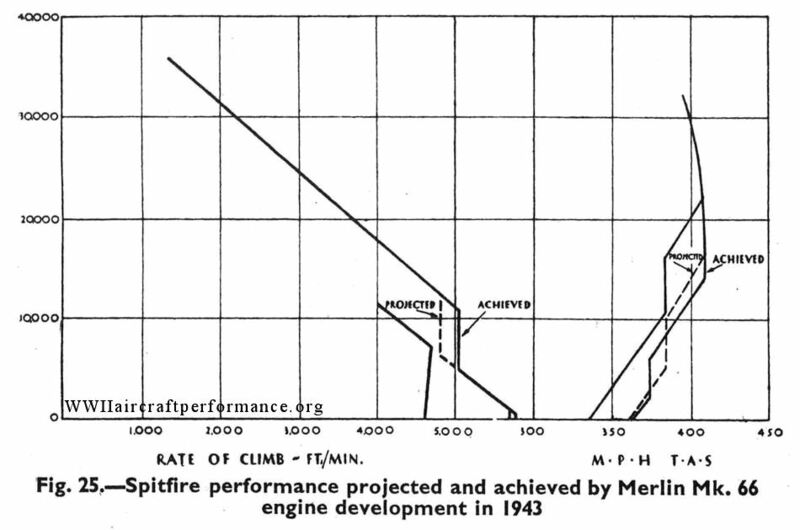 inch boost the Spitfire is equal in rate of climb to the Me 109 G-2; when operating at +18 lb. per sq. inch boost it is superior to all German fighters at present in service. ..................The ceiling of the Spitfire IX is considerably higher than that of the Me 109 G or the Fw 190 A at present in service. No. 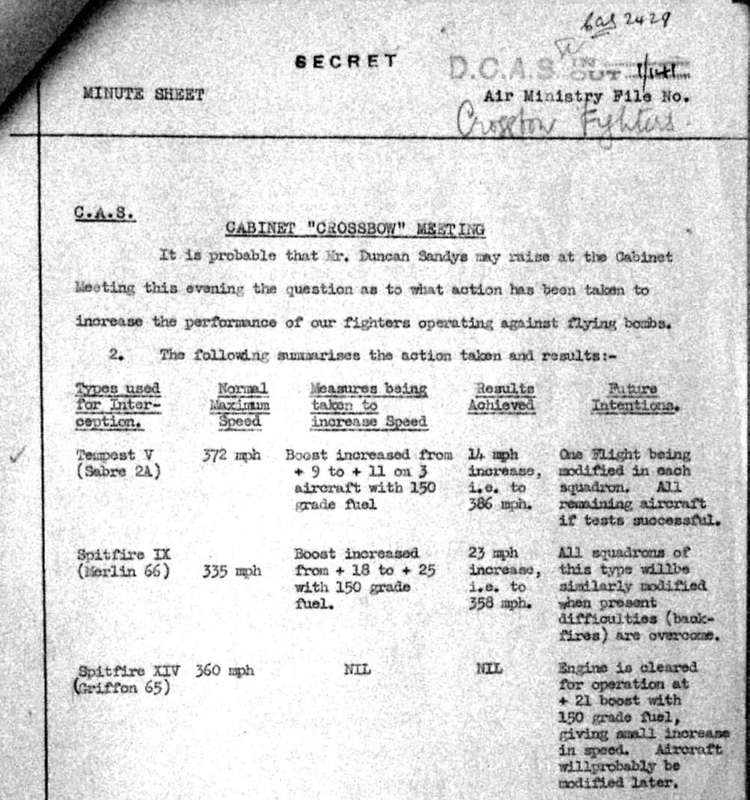 64 Squadron at Hornchurch was the first squadron to go operational with Spitfire IXs (28-July-1942). Deliveries of more powerful Spitfire IXs equipped with Merlin 63, 66, or 70s commenced in early 1943. No 611 Squadron at Biggin Hill was the first to use the Merlin 66 engined Spitfire LF IX on operations (March 1943). 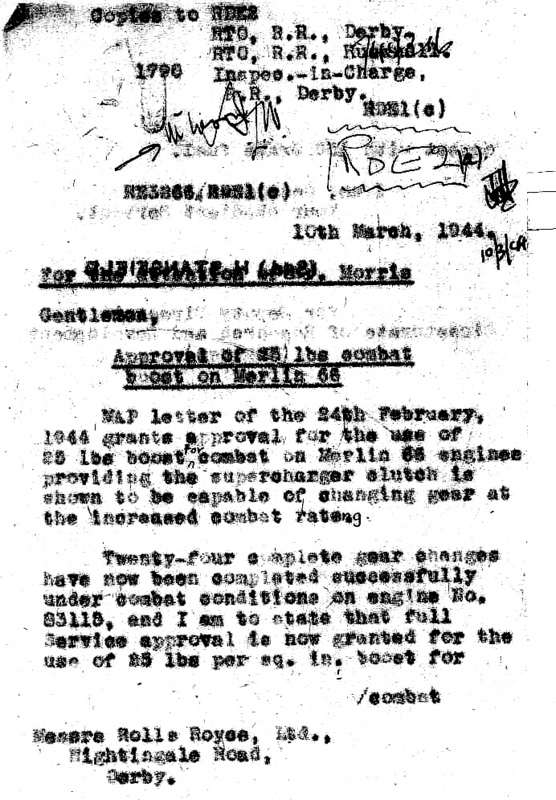 Full service approval of +25 lbs boost was granted 10 March 1944, providing considerable improvement in low altitude performance. No. 1 and No. 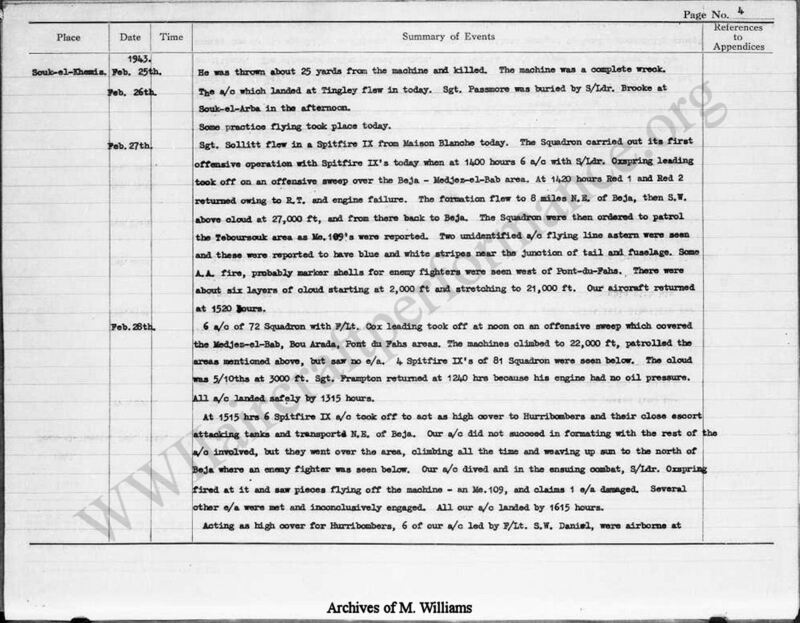 165 squadrons at Predannack were the first to convert their Spitfires to +25 lbs boost, taking 2 days off from operations in early May 44 to do so. 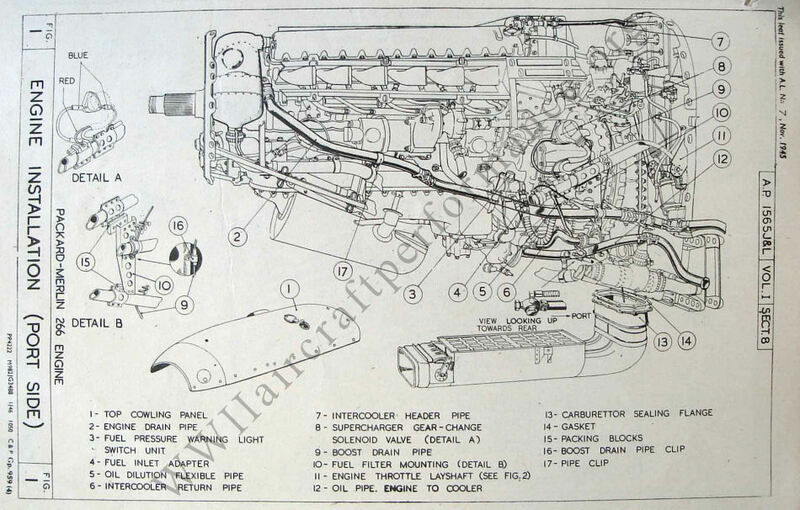 Rolls-Royce Merlin 63, 63A, 64, 72 & 73 Engines, Altitude Performance at 3000 R.P.M. Handling with rear fuselage tank and metal elevators.